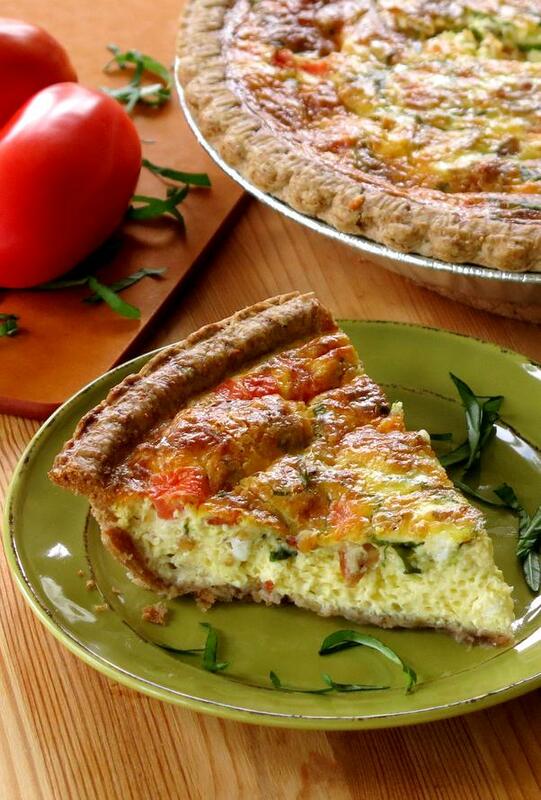 Tomato Bacon Quiche with lots of fresh basil. Make two. One to enjoy now and another to freeze and savor when summer’s bounty is long gone. Tomatoes and basil. You’ll find plenty of these at my house this time of year. If you find yourself with an abundance of produce, or you just love fruits and veggies, then my healthy foodie and nutritionist friends in The Recipe Redux have rounded-up some terrific recipes that you won’t want to miss. Check out the links below. It can be assembled and frozen (before cooking) for an easy meal any time. The crustless quiche filling is literally one of the easiest make and freeze recipes around. It calls for a healthy whole wheat pie crust or it can be made crustless for a gluten-free, low-carb option. It’s an Easy Prep/Hands-Off Cooking recipe…and who doesn’t love to sit back and relax while a delicious dinner bakes in the oven. In my mind this is a “BLT” quiche. After all, there’s bacon, tomato…and lots of leafy basil! What do you think? 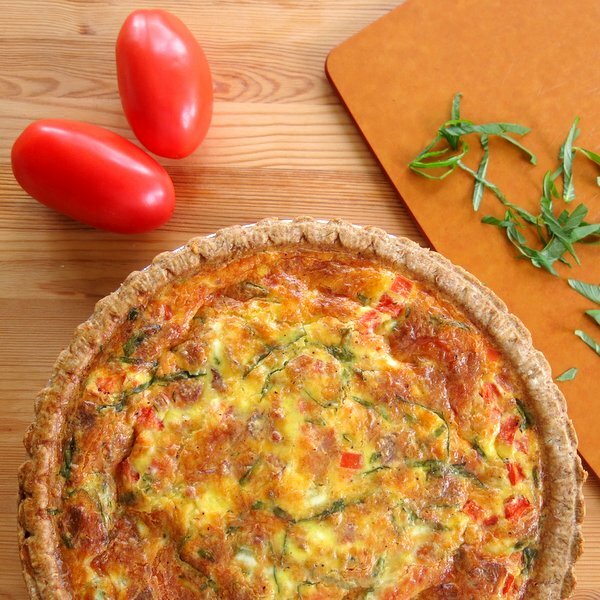 This gorgeous tomato bacon quiche (if I do say so myself) baked in a prepared whole wheat pie crust. If you are feeling ambitious, check out this recipe for whole wheat pie crust by Well Plated by Erin, and make your own. Or, don’t use a pie crust at all. This mixture will cook up beautifully, just like this Crustless Asparagus quiche recipe. Bacon – It just can’t be a BLT without it. My favorite options are nitrite free and turkey bacon. Leafy Basil – Stack, roll and cut into slivers with your kitchen shears. Tomatoes – Plum tomatoes are easy to seed and dice. But, any type that is overtaking your kitchen will work. Tomato Bacon and Basil Quiche is perfect for breakfast, lunch or dinner. Combine eggs, milk, salt, pepper and cheese in a bowl. Fold bacon, tomatoes and basil into the egg mixture. Pour quiche mixture into a pie crust. Using a fork, evenly distribute ingredients. Bake quiche uncovered for 60-70 minutes or until an inserted knife comes out clean. The top should be lightly browned and the quiche will continue to set after removed from the oven. Allow quiche to sit for 10-15 minutes before cutting. Quiche can be frozen before or after cooking. Before cooking add all of the ingredients (except for pie crust) to a plastic bag that seals. Store in freezer. When ready to cook, defrost in the refrigerator, pour mixture into pie crust and cook as directed. After cooking, wrap slices with plastic wrap and place in freezer. Slices can be re-heated in the microwave or oven. Omit the pie crust and make this a crustless quiche! Our garden is late this year so I’m still waiting for the influx of tomatoes – but as soon as it hits, this recipe is going on my must-make list! I love quiche that has a great crust like this one! May need to stock my deep freezer with these! This looks absolutely delicious! It’s been too long since I last has some quiche! I love simple summer recipes using fresh seasonal ingredients! Looks amazing!! I love a good quiche… need to make them more often. Pinning yours! 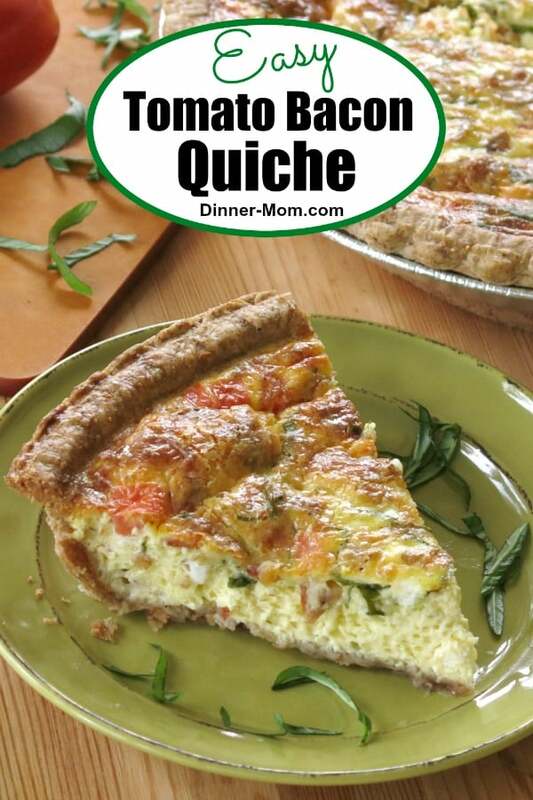 I adore quiche and I bet the basil makes this extra delicious! This is the best idea for a quiche! I like the idea of freezing one for later! Beautiful! I need some make ahead and freeze recipes– having a baby in about 2 weeks and keep reading I should have healthy meals frozen and ready to go! Probably a good idea, since my husband makes 1 dinner– salmon and roasted veggies. It’s wonderful, but we can’t eat it every night, and that’s about all he wants to make! I was totally thinking basil too when I read this months challenge! I can’t remember the last time I made quiche. It’s something we always enjoy and I need to add it to my to-cook list for the weekend! Love your BLT version. I am ALWAYS over-ambitious at the farmers market – I can’t control myself. 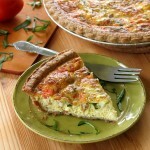 I love the BLT spin on this quiche, it looks amazing! I have to agree with you – this quiche is definitely gorgeous! I’m partial to crustless quiches, but making one with a whole wheat crust is something I need to try. Just a heads up, your recipe never mentions when to add the cheese! Thanks so much for your comment! Updated!!! Yay!!! I’m so glad you liked it!! !